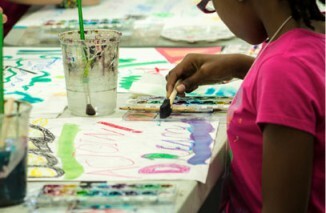 Arts for Learning (A4L) partners with Centro Mater to provide the arts component of the After-School program. 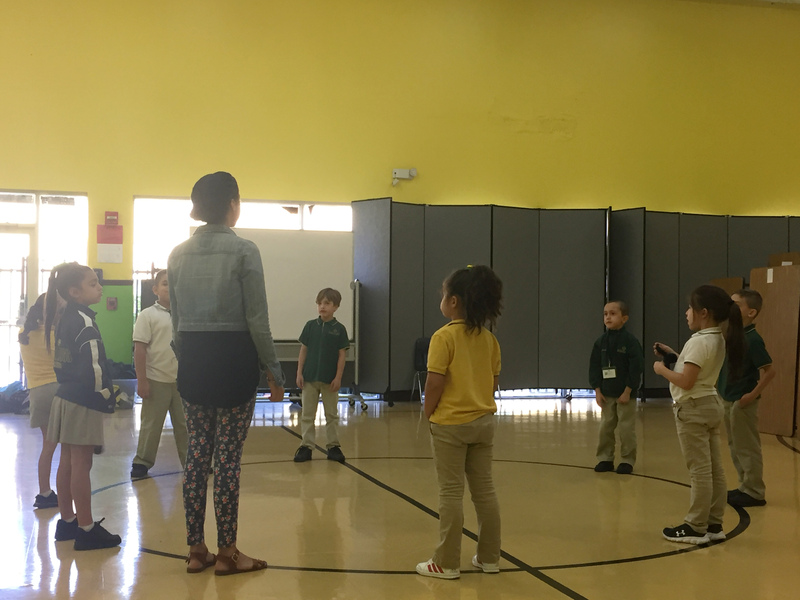 A4L teaching artists provide classes in a specific art form at each of the centers, and children have an opportunity to engage in an art form for a term, along with the other programming provided by Centro Mater, including snack and homework/study time. It is no surprise to me that A4L is a close partner with Centro Mater. Their missions are quite aligned, although you might assume a music, or visual arts, or theater class might have different objectives. 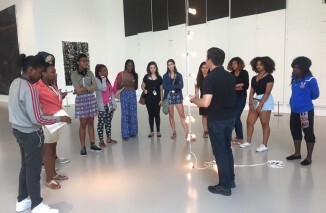 This synergy between A4L and Centro Mater was evident at each site, and in each art form. Whether it was in Michael Gil’s music class at Centro Mater East, or Jose Garcia’s visual arts class at Centro Mater West 1, or Nathalie Varona’s theater class at Centro Mater West 2, the teaching artists immersed the kids in their respective art forms, and blended academic and social skills, as well as the techniques of each art form together to create an engaging, joyful, and impressive class at each site. The A4L teaching artists were consummate teachers as well as artists. The kids seemed to respond differently to artists than to us ordinary adults (including us regular teachers). The fact that this was after school, with a more relaxed atmosphere contributed, of course, but it was also the passion, expression, gifts and talents that these teaching artists display – which are not part of the rest of the routine of the day – that instantly mesmerized and commanded the kids’ attention. 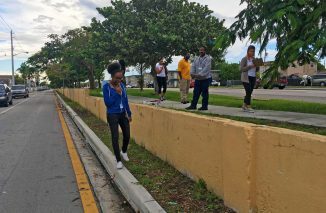 Michael Gil, Jose Garcia, and Nathalie Varona, each had a personal warmth and obvious passion for their art that they could not help but share with love. That also meant setting expectations for their students. 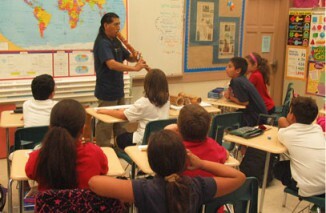 In each of the classes, the students were utterly respectful and engaged. They were also completely comfortable with one another, and with the teaching artist. They were eager to work together; to help each other; to share what they were learning and practicing. Yes, they were eager to practice! Michael Gil is a supremely gifted percussionist/musician and educator. Imagine having a class of approximately 20 K-1st grade students after school, who are expected to learn to play percussion. I was expecting a bit of craziness and a lot of cacophony. What I observed was thrilling: Michael commenced the lesson with an introductory exercise, directing the kids to close their eyes for one minute to practice listening (and to sit properly). “You have to listen and understand music with your body first. Listening and watching are important actions,” Michael directed. The lesson proceeded with his dividing the class into groups and introducing different percussive patterns to each group. He reinforced each rhythm using a myriad of techniques: Verbal: “Bass, Bass, High, Bass, Bass.” Then adding drums with words. Then counting, reinforcing math and its relationship to music, and as an aid to rhythm. 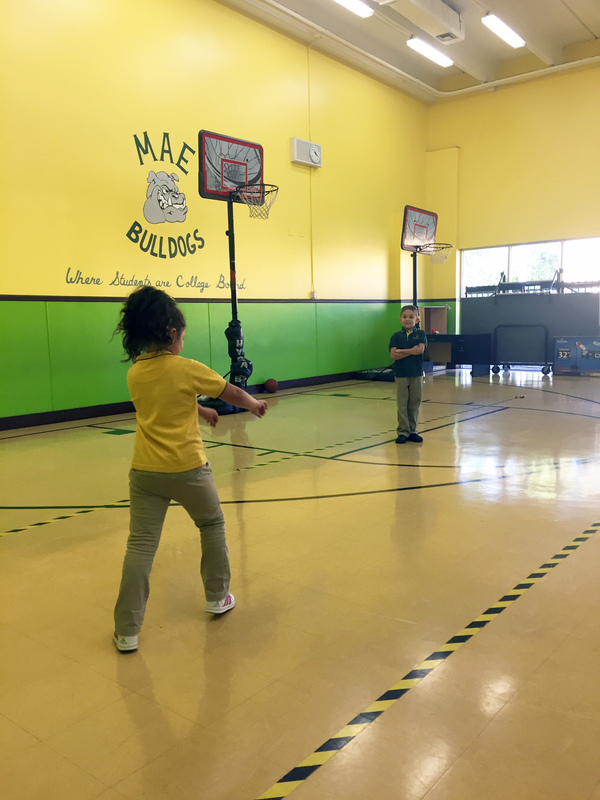 Students had different colored plastic tubes to beat to the rhythmic patterns, each color tube a different length. Michael added his own syncopated beats while the kids were practicing their group (color-coded) rhythms. There was so much going on here; total immersion and blending so many concepts, in several domains, through music. He interspersed other musical concepts, including dynamics (playing softly; crescendo), and how to be respectful to one another and to instruments. Finally, he closed the class with everyone back in their seats with their eyes closed. Silence for two minutes – an amazing feat. As in any class, some kids may be engaged, but not quite mastering the task or skill. When we are so dazzled by an artistic work, we may only focus on the mastery of the technique or the final product, but the work of art is not merely a master piece; it is the process of engagement. The A4L approach emphasizes process, which is why so many kids benefit in so many ways from this methodology. These are more than acting skills; these are life skills. 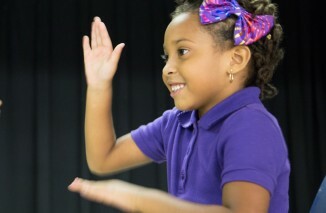 Her loving smiles and positive verbal reinforcements throughout the class instilled in them an eagerness to participate. 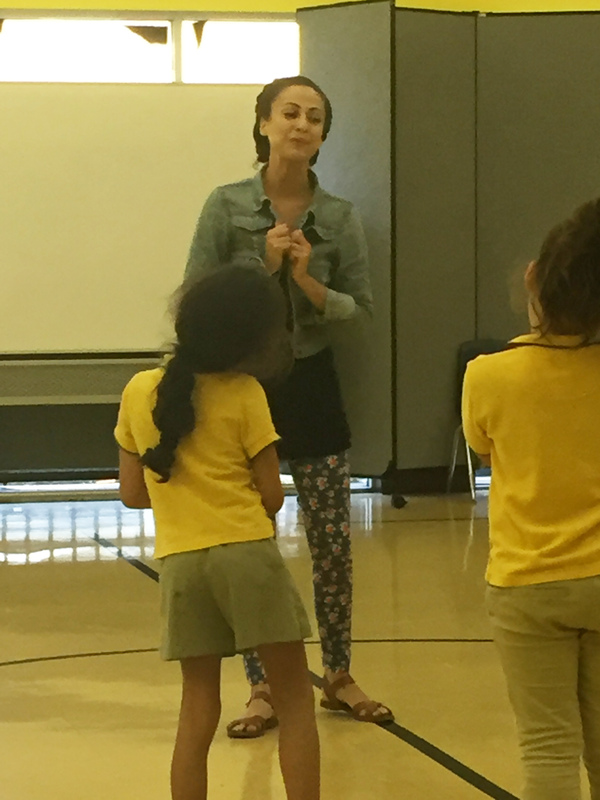 She reminded them to listen first, and students were fully immersed as actors and as audience. Learning to be an audience member is a skill that many others do not learn. 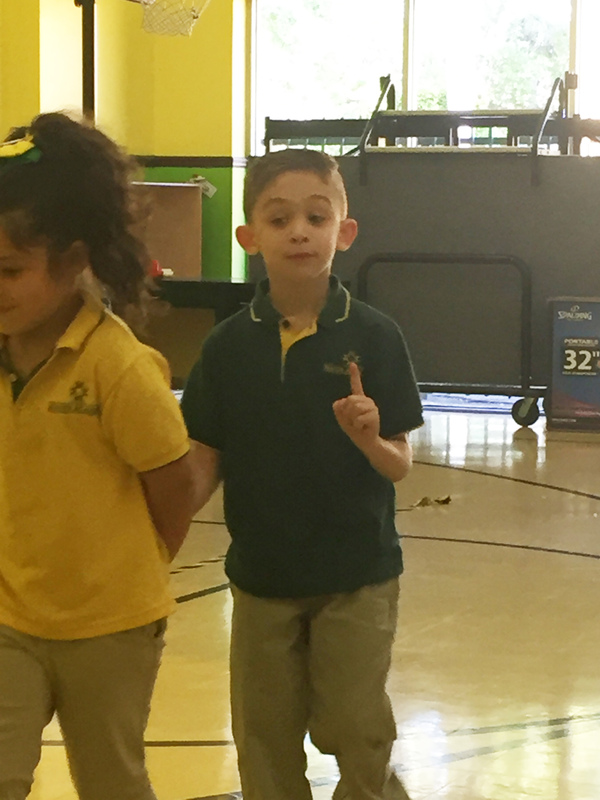 Acting class, even for first graders, is not merely emoting or pretending. 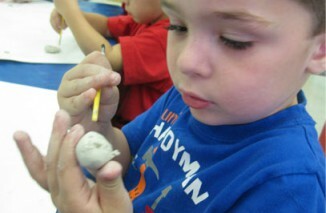 It requires children moving back and forth between concrete and abstract thoughts. It also requires maintaining an idea throughout a scene—following through with an idea. 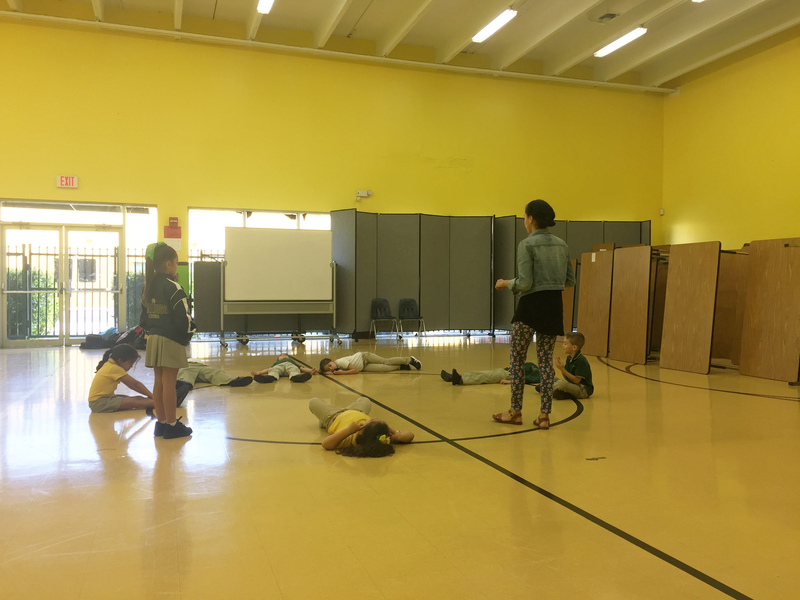 The students were completely immersed in the theater exercises, which blended concepts applicable to an array of skills beyond the theater. After the improvisation exercise, Nathalie had students work in pairs to create and perform a story. She contrasted the improvisation, which is listening and reacting to the other person, with performing an established story—with a beginning, middle, and end, as well as identifiable characters. 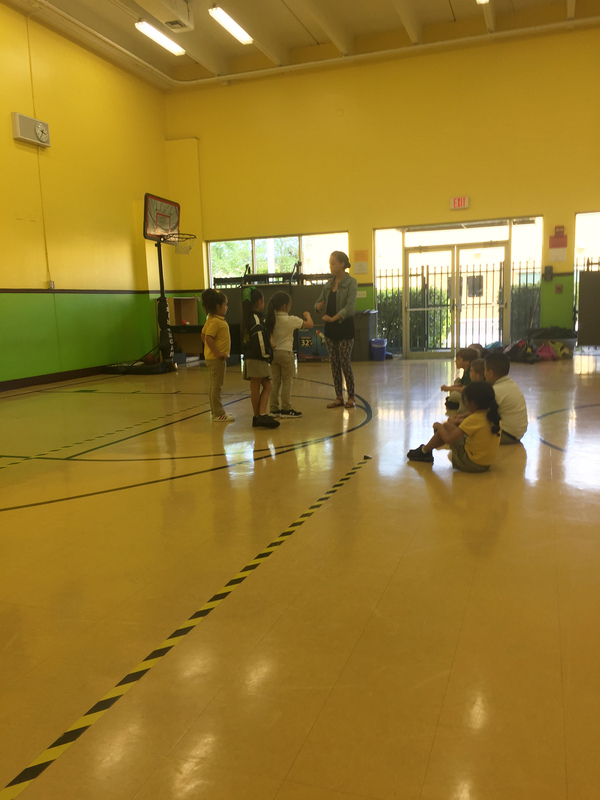 She reminded her students of the importance of concentration and of our space: “Remember that we move and have emotions.” Students were developing skills that foster noticing and attention. The skills that Nathalie is having these youngsters practice will enhance every other skill this group of children will encounter as they develop. The theme of Jose Garcia’s visual arts class is books. I love that the emphasis is on the relationship between books and art—not merely picture books, but books as art. Jose taught the students about different types of books and book binding in previous sessions. It is worth noting that the classroom where this class is held has a wonderful book nook, with a sofa on which to get cozy and read. The bookshelves around the large room were filled to capacity. 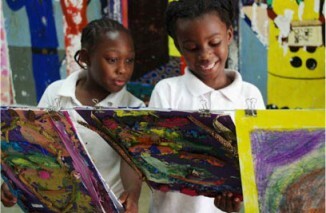 Connecting art and books is yet another example of a holistic approach to learning. The pace and atmosphere of this class was much quieter than the classes at the other sites. 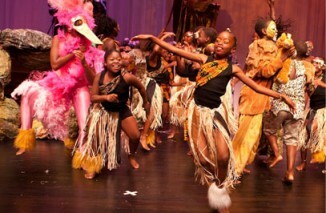 The students were older, and the art form was quieter…and, they were immersed in books! In addition to learning about book binding methods, students were working on other book projects—expanding their concepts of books. They practiced with using a dry medium as well as watercolors, and had their own sketchbooks where they “pre-visualized” their projects. Approximately 15 students were working in small groups. Girls tended to work with girls and boys tended to work with boys, collaborating on one project in pairs, and working on individual projects with input from each other. They were totally engaged in their drawings and researching ideas and images for inspiration for their books. They were immersed in the art form, while Jose was blending the concepts necessary for project management, as well as art concepts. Jose emphasized the steps to completing a project: 1. Brainstorming 2. Critical Thinking 3. Time Management. He used books as examples of collaboration, adding pattern, filling space, and color. He stressed thinking critically about the work and asked the students to reflect and critique their works. The question, “What could we add?” encouraged further critical thinking and even safe risk-taking—skills that foster achievement and growth. Each student was fully engaged with a project. There was more individual work done in this class, but the emphasis on collaboration and critical thinking provided a unique balance of ownership and connecting. These three A4L teaching artists exemplified how arts are indeed for learning within and across domains. These teaching artists are “immersion blenders”: providing an arts experience; ensuring understanding; providing opportunities to create and connect. After-School programs matter. Centro Mater knows this. Arts for Learning knows this. 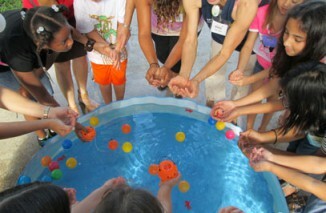 “Immersion Blenders” are essential to creating the future of our community.